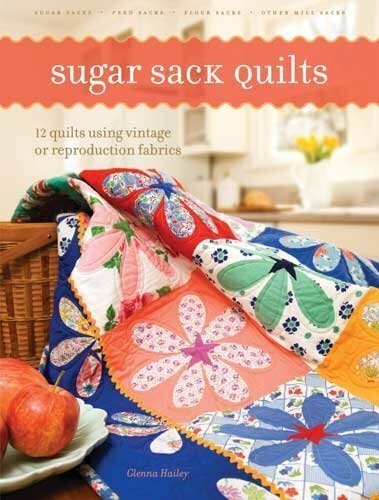 I can't believe it's been 10 years since Hollyhock Quilts came to be! Bill was thinking about leaving his job, but he was too young and we were too poor for him to retire. 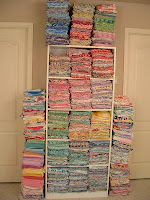 I had been collecting vintage feedsacks and fabrics, vintage quilts, tops and blocks, and most any other vintage textile I could get my hands on for almost 15 years and it was taking over our house! So I decided I'd try selling feedsack squares online. I had a friend set me up a website in 2003 and started cutting 6" squares. 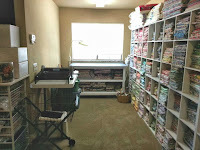 Who knew that a few years later I'd be designing fabric and quilts, publishing patterns, writing a book and traveling here and there giving lectures and classes to quilter friends from all over as well as trying to keep up with a retail website? It's been a blessing and a great ride! I think about what this business has seen us through. Bill was able to retire and help me full time. Thank goodness for that since it left me much more time to be creative when I really needed to be. He's been my accountant, computer guy, packing and shipping department, square cutter, errand boy, mule and anything else I needed him to be. What a joy to be able to do this together! It's seen us through the loss of both of our Moms, clearing out their estates, making a huge move ourselves, and the adoption of 4 grandchildren. You've been there through all of that! Thank you for caring. Well, I've come full circle it seems. I'm not too inclined to design new patterns (although I do plan to add some of my magazine quilts as PDF patterns) and have no desire to ever design fabric again! Too much work!! I love making little projects using my vintage stash and selling the things I know I'll never be able to use in one lifetime. 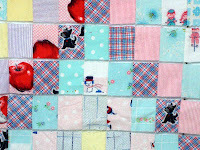 Starting this week I'm back to selling feedsacks and vintage fabric on eBay and Etsy along with many more vintage items, just to clear things out. You've seen how much crap great stuff I have! It's got to go. You'll also see lots of fun things shown here and on the tabs above over the next few months. We're still making up for lost time with travel and enjoying our new lives. I'm just so glad I have you to share it with! I've come to know many of you as though we have been friends a long time. Most of you I have never seen face to face, but I consider you important to my life. This blog has been a blessing to me because you were willing to take a couple of minutes to read it. Thank you so much! Please know that I treasure each and every one of you.